Club Penguin Cheats by Mimo777 Club Penguin Cheats by Mimo777: Happy77 Talks Club Penguin Toys! Ok, this is BIG... or at least bigger! "Q: The orange puffle seems pretty loved. But what else is new? A: The newest toys are some 9" stuffed toy penguins - there are a few different ones - including Rockhopper! A: They'll be in Disneyland Resort in California and at Walt Disney World, Florida really soon - and the team's working hard to get them in more places, too - like in Disney Stores and at the CP Online Shop. Keep checking those places. Also, each one comes with a code to unlock items online. And we've updated the Treasure Book! A: Give us all your feedback. Tell us what you like, what you don't like, and what you'd like to see in the future!" 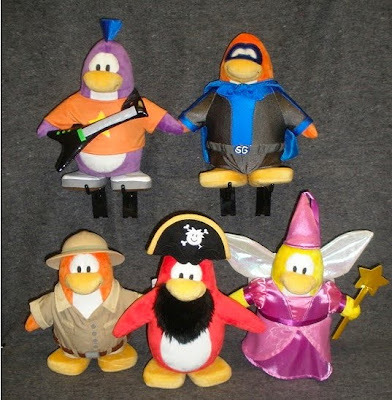 Club Penguin Series #3 toys had a Rockhopper plush toy, but it, along with all the previous plush toys, were only 6 1/2 inches tall. These new plush toys are 9 inches! Wow! Cool! Bigger toys, bigger fun! What do you think about bigger Club Penguin toys? Awesome Game! Truck Launch Maniac! Sweet! Giant Penguins are taking over the world! Ahh! And Giant Pins are taking over Club Penguin. Ahh! Hey mimo don't you think the orange puffles ROCK! i seem to remember i think it was maybe the last mission that cp came out with but i think herbert said something about taking puffles away. i think he said something like this but im not quite sure " Hmm, what do penguins love the most? ... PUFFLES! ill steal them!" as i said im not quite sure if that he said that but i am pretty sure that he did say something along the lines of that. and i wonder if they are ever gonna make a organizer thing that is a Secret Agent Phone!? This it AWESOME! I LOVE the Club Penguin toys! hey mimo, in the mod category, it says ABOUT TO NO BE MOD? what does that mean? did you mean about to not be mod? does that me they will be de-modded or what? thx. It means they're about to get kicked off the mod list. Whoa! I only have a few! Hey! That means that they are about to lose there mod job because either they weren't helping people enough or being rude :) hope this helps! It does mean you will be de-modded. Only because you havent been modding in a while or you have stopped modding. So keep modding on mimos site! Oh, sweet! I'm going to Disney world for spring break!! I'll be sure to buy a couple! Keep on Wadell-ing! P.S. Have you given any thought to Tap Tap, Mimo? Well your partly right.....they are sort of fired.Hope I help Luis2414(cpgMod)ps Cool Name! Yes, you are correct! Good eyes and memory. that means that the people under that are about to be kicked off the mod list. yes, they will be "de-modded." I think that "About To No Be Mod) means about to Not be Mod. It's weird I never noticed that! Good eye! It means that if they don't start Modding again, they will be removed. Does this help? I was thinking the same thing today too. And what about your interview with zoe? yep. just set up a time with mimo to meet. have i modded this comment before? wait...yeah. so..uhh..just set up a time with mimo! It seems the "about to no be mods" havent worked for a while. So Mimo puts them in that category. If youre a mod you will have to keep modding! There cant be any monthly or yearly breaks! If you have a Twitter Mimo may send you a DM! yes kidda what u said. it means they have not been helping people very often, so they have gone down levels in mods. mimo wants to make sure that people who help people in comments get reconized, so he takes those who dont help out, and people who do help in. WAİT! Yarr did NOT just run away! HE İS STOLEN! Remember what herert was upto when we were watching him in the LAst adventure? He was pto somethin about cuddler puffles!!! He sTOLE Rockhopper's yarr when he was arriving at the cp island. You know that he is also an inventor, Herbert, so he invented a driller-submarine, and started drilling from the mine, to the under of the ocean, when he reached the ocean, he went to rockhopper island and reached the migrator. He ran a tail after the rockhopper, and when he reached the island of penguins, rockhopper, herbert stole YARR!! I made a thiery, I Know you love thierys lol, On Club Penguin there's alot of weird things, I decided to make thiery. The leaking water at the pool, may have something to do with the Rock Slide, The water might go to the Mine, Probably a Water Party will come, i'm also thinking it might have something to do with New Mission. Awwwwwww cool! Mimo a few days ago i saw the RH toy at Toys R Us. Thanks mimo youve been a big help! Hey Mimo! Today I met Rockhopper, and we found Yarr in the mine!! He was just sitting there bouncing, and then we went and got him! Now Rockhopper has him on his player card! He's not lost anymore!! I recorded it and it's on youtube, and pics of him and yarr are on my website. I just thought I'd let ya know! You are exactly right! It means that they aren't working hard enough so the next time mod changes come around they may be removed from the mod list! Yeah you are right! I was thinking maybe a week- 2 weeks or so! Well first you have to become a Mimo mod or higher. Then somehow mimo will figure out a time to meet. I am thinking you can use Twitter or email to chat about what works best. Then you add him as your buddy on CP! I know right! I have like 14 of them! I have 6 puffles and 8 penguins! But it would be kkinda weird having giant penguins and smaller penguins together so i will try and stick with small penguins! I hope so! Maybe in the next month or two weeks? I have 17! Your right, better make some room! *starts burning homework in a fire* Got rid of the useless stuff! I think he tells you on Twitter. If you don't have one, he probably emails you.And he probably does let you meet him more than once. After all, Mimo mods are his buddies! Aren't you one? Hey! That happened to me too! After that, we had story time! It went, "There were giant shrimp to the right of me. There were giant shrimp to the left of me. Then I realized that giant shrimp were really small. So I stepped over them and escaped." Lol! Then we had a toot parade! Wait.. Does that mean more money? Sorry Ronaldbeach! Mimo777 can only meet penguins that are ranked a Mimo Mod or higher! otherwise it wouldn't be fair. *Smacks forhead with palm of hand* Ok let me just cut out the first part of the question. Can we do it more than once? Yep he said "I've cooked up quite a scheme and it involves your precious little puffles..."